Borscht soup is a Russian traditional beet soup. It’s packed with vitamins and has a distinctive vibrant red colour. This is the original Russian recipe from my Mother. I can’t believe that I still haven’t shared this Russian classic on the blog. My Mum is Russian, I grew up in a Russian family and that means that we ate a lot of Borsch growing up! Borsch is cooked in our family at least once every fortnight until this very day. My whole family loves it, and I love it too. It’s a warming hearty soup that can be served all year round. I love the fact that it’s packed with vitamins and good stuff, and made very simple ingredients. This recipe that I’m sharing with you today is a vegan version of the original Russian Borscht recipe. This is exactly the way we cook it in our family, the only thing that I’ve done differently is substituting smetana or sour cream with soy yogurt. Borsch or Borscht (борщ in Russian) is a healthy and filling soup that comes from the former Russian Empire. With beetroot being the main ingredient in this soup, it has a distinctive red colour. There are many different variations of this soup. It’s mainly made from beets, cabbage, potatoes, carrots, and spices. IS BORSCHT A RUSSIAN SOUP? I believe that Borscht is Russia’s national dish. As I mentioned before, the soup comes from the former Russian Empire. There are different variations of this soup in Eastern Europe, such as Ukraine, Bulgaria, Poland (try my Polish Borscht soup), Lithuania, Belarus and Armenia. IS BORSCHT A VEGAN SOUP? This version of Borscht that I’m sharing with you in this post is vegan. However, this soup can be made with meat (beef), with bone stock or both. It can also be served with hard boiled eggs or without to be served vegetarian. If you want this soup to be even more filling with more protein, you could add some beans. This soup can be served hot or cold. In the summer, it can be blended with smetana, kefir or sour cream and served cold. Once blended with Smetana, it will have a very pretty deep pink colour. In Russia, the cold variation of Borscht soup is called Svekolnik (beetroot soup), and in Belarus it’s called Khaladnik. The main ingredient for this soup is beetroot. Beets can be either roasted, boiled or sauteed. In this version, I boil half of the beets used and saute the rest. You will need a deep pot to make the soup, and a pan to saute the vegetables. Start by grating the beets and the carrots, then dice the potatoes, onions and shred the cabbage. Leave the garlic cloves as they are, just peel the skin and set aside. Start by adding water to your pot, when it starts to boil add half of the grated beets and let them cook with cardamom and cumin. Heat some vegetable oil in a pan (I use corn oil). Then saute the onions until they’re soft and translucent. Add the garlic and cook for a minute. Add the grated carrot, and cook until the carrot is soft and tender. Add the rest of the beetroot, followed by a 200 ml of either water or the beet soup that’s being cooked in the pot. At this point, I like to add a vegetable stock cube to the liquid for extra flavour, along with the tomato paste. Cook the vegetables for a few minutes until the beets become soft. Add the shredded cabbage to the pot, followed by the rest of the spices and let it cook until the cabbage becomes semi-tender. Then add the potatoes, and cook for 10 more minutes. Finally, add the sauteed vegetables from the pan to the pot, cover the pot and cook until the potatoes are soft and tender. I created a step by step video to show you how we make Borscht soup in our house. 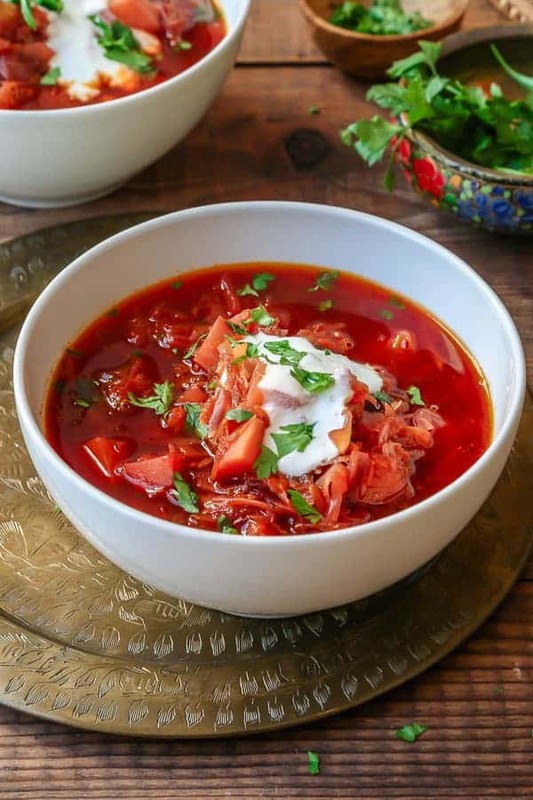 Borscht soup is usually served with Smetana which is a runnier version of sour cream, Smetana is found every grocery store in Russia and most Eastern European countries. The soup is usually garnished with chopped dill, but can also be garnished with chopped parsley, scallions or chives. In our family, we love Borscht with a piece of rye bread (we call it black bread in Russia!) and gherkins. If you make these Middle Eastern lupini beans, please don’t forget to rate this recipe and share a picture on social media. Tag #LittleSunnyKitchen in your posts as I would really love to see what you make! Thank you for supporting Little Sunny Kitchen, so I can keep sharing my family recipes with you for free. A Russian classic recipe. This vegan version of Borscht is made from beets, just how my mother makes it. In a large pot, add water and let it boil. Then add half of the grated beetroot, cumin and cardamom and cook until beets become soft. In a pan, add oil and cook onions until they're soft and translucent. Then add the garlic and cook for one more minute. Add the rest of the beetroot, followed by a 200 ml of either water or the beet soup that's being cooked in the pot. Add a vegetable stock cube to the liquid for extra flavour, along with the tomato paste. Cook the vegetables for a few minutes until the beets become soft. At this point, you can remove the garlic cloves if you like. I usually just leave them. Serve with a dollop of soy yogurt (you can use Smetana or sour cream if you don't follow a plant-based diet). Love the bright color! looks so flavorful and delicious.. i have all thr ingredients and will give this souo a try soon! I’ve never tried borscht, but I like all the ingredients in it so I’m sure it’s delicious! I’ll have to try it. I’ve never seen borscht that wasn’t blended smooth and creamy — this gives it a whole new dimension! Beautiful. This looks yummy! I have never had this before and am excited to try it! Thanks for the recipe! I learned about borscht as a little girl but I never saw a recipe for it! This is so cool, thanks so much!